Looking for something out of the ordinary? Why not experience the ‘Ride of Your Life’ in Matt Hall’s amazing Extra 300L? Jump on board with a #TeamMHR Pilot and try this adrenaline seekers dream! Take in the sights and experience some high intensity aerobatics with our most popular flying experience. You'll have enough time to take a break and enjoy the scenery before you push yourself to the next level with high energy aerobatics! Only at Lake Macquarie Airport can you Fly with The Matt Hall Racing Team and Skydive in the one breathtaking location! 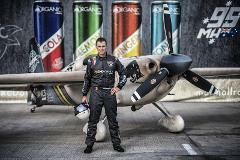 The ONLY place you can fly with Matt Hall - Australia's Red Bull Air Race Pilot. This extreme 20-minute high energy flight is one of the ‘must do’ activities on everyone’s bucket list!